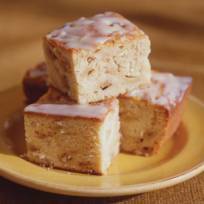 A delicious final touch, the glaze adds a hint of extra flavor and an attractive sheen to this coffee cake. Preheat oven to 350°F (180°C). Grease and flour a 9-inch round springform pan or a 9 x 9-inch square baking pan or baking dish *(see note). In another bowl, toss the apples with the juice. In a small bowl, stir together the brown sugar, cardamom and cinnamon. Add to the apples and toss to coat. Set aside. In the bowl of an electric mixer fitted with the flat beater, combine the butter, cream cheese, granulated sugar and vanilla and beat on medium speed until light and fluffy. Add the eggs, one at a time, beating well after each addition. Add the flour mixture in 2 or 3 additions and beat well until smooth. Using a large rubber spatula, gently fold in the apples just until evenly distributed, no more than a few strokes. Do not overmix. Spoon the batter into the prepared pan and spread evenly. Bake until the top is golden brown and a toothpick inserted into the center of the cake comes out clean, 60 to 70 minutes. Transfer the pan to a wire rack and let cool for 5 minutes. In a small bowl, whisk together the confectioners’ sugar, the 2 tbsp. milk and the vanilla until smooth and pourable. Adjust the consistency of the glaze by adding more milk, a few drops at a time, if needed. Remove the sides of the springform pan, if using, and place the cake on a wire rack set over a piece of waxed paper to catch any drips. While the cake is warm, drizzle with the glaze. Let the cake cool to room temperature. Cut into wedges or squares to serve. Note: If using a glass baking dish, reduce the oven temperature to 325°F (160°C). This recipe came out perfect. Took it to a potluck and everyone loved it. The cake was soft and fragant with the spices. I substitued 2 Tbsp. of lemon juice and omitted the milk and vanilla for the icing for a tart taste. Mine doesn't look anything like the high, beautiful coffee cake in the picture. I did bake it in a spring form pan for 70 minutes but it's undercooked and sank when I took it out of the oven. It does taste good but I think I'll stick to jewish apple cake. Fantasticulous!! I reduced the cream cheese and sugar contents. I also took the advise about the Lemon Juice and found that the tartness was perfect for balance. I don't know what condensed skim milk is though.